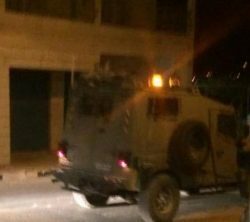 Israeli soldiers invaded, on Friday at dawn, the northern West Bank city of Tulkarem and kidnapped two siblings after storming their homes. The soldiers also invaded a village near the northern West Bank city of Jenin. The Tulkarem office of the Palestinian Prisoners Society (PPS) has reported that the soldiers kidnapped Moath Jasser Awwad, 25, and his brother Morad, 23, after invading their homes and violently searching it. In addition, the soldiers invaded Be’er al-Basha village, south of the northern West Bank city of Jenin, and broke into the home of a young man, identified as Odai Ghawadra. The soldiers interrogated him and his family, while ransacking the property, and withdrew later. In related news, dozens of soldiers invaded ‘Aida refugee camp, in Bethlehem, and searched at least six homes.